Experience the delights of Galway Bay surrounded by the Burren region and the Cliffs of Moher, facing spectacular Connemara across the water with the Aran Islands lying at the mouth of this world famous inlet. Staying in city center accommodation for two (2) nights in the heart of vibrant and cultural Galway City also known as "The City of the Tribes." Tour does not operate on Tuesdays, Sundays, or St. Patrick's Day. Check-in for 7:00 am departure from Dublin Heuston. As your train departs, we travel in a south westerly direction, through Dublin's western suburbs and then through the lush fertile countryside of Co. Kildare. Our journey takes us through the Curragh which is famous for its racecourse, home of the Irish Derby, and there are many stud farms in the vicinity. One of the train stops is Thurles, where the Gaelic Athletic Association (GAA) was founded in 1884. The GAA is the sporting body responsible for promoting Ireland's National sports, Gaelic Football and Hurling. We change trains at Limerick Junction for the Limerick bound train. 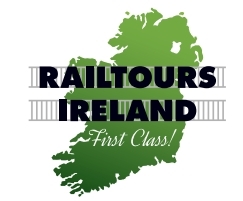 Arrive into Limerick where we will join our Railtours Ireland tour coach. Limerick has a population of about 90,000 and its city charter was granted in 1197 AD, making it older than London! As we cross the river Shannon which is Ireland's longest river you will see views of King John's Castle to the right. The castle was completed in 1200 and marks the origins of the city. Limerick's most famous author, Frank McCourt, grew up here and was the setting for his book, ‘Angela's Ashes'. Limerick is also the birthplace of celebrated BBC radio DJ, Terry Wogan and Hollywood star, Richard Harris. We will pass the GAA grounds of Páirc na nGael -the home ground of County Limerick's Hurling and Gaelic Football teams. Limerick is also the home of Irish Rubgy and we will pass Thomond Park, the Rugby stadium. After a brief city tour we travel onto Bunratty Castle and Folk Park. The castle was completed in 1425 and, after many years of neglect, has been restored to its former glory. There is also a folk park here which you will have time to explore. After the visit to Bunratty Castle and Folk Park we make our way to Co. Clare. There is a lunch stop at O'Connor's Pub in Doolin before arriving at the Cliffs of Moher, among the highest sea cliffs in Europe. There is plenty of time to visit Ireland's second most popular tourist attraction and your host will advise you of the departure time. From here we take the coast road for much of the way to Galway, with time for photos along The Burren. This is a national park and the word Burren comes from the Irish Language, it means ‘rocky place'. It is a unique lunar landscape of limestone which was described in 1649 by one of Oliver Cromwell's men as: “No tree to hang a man, no water deep enough to drown him and no soil deep enough to bury him”. Today the Burren is noted for its diverse Flora with few parallels elsewhere in Ireland or indeed, Europe. We continue along the coast road to Black Head, passing the quaint coastal villages of Ballyvaughan and Kinvara before joining the main road to Galway. Overnight Stay: Galway . Enjoy a full Irish Breakfast at your leisure. 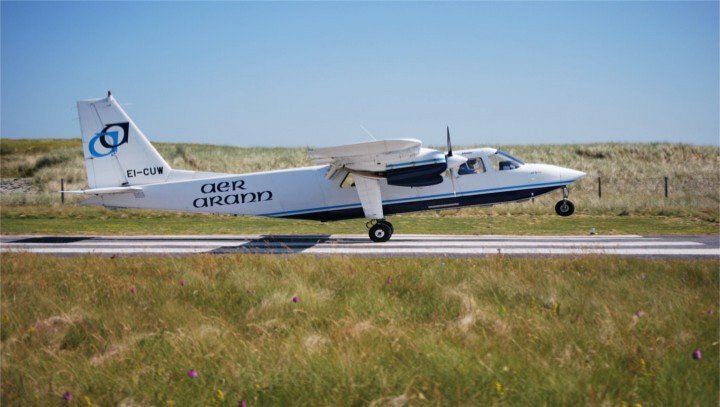 Depart via the Aer Arran mini-coach for transfer to Connemara Airport for your short flight to Inis Mór. Irish is the spoken language on the Aran Islands although the locals will be more than happy to speak to you in English. For many, the highlight of the tour is the formidable pre-Christian fort of Dún Aonghusa, with spectacular sea-cliffs on the western side and unspoilt views of the Atlantic Ocean. Flight times may vary occasionally to cater for the numbers flying. Please note: Should weather conditions be such as to curtail flights you will be taken on an alternative tour to Connemara and refunded the difference. No further refund available should you decide not to go to Connemara for any reason. Overnight Stay: Galway. 10:05 am: depart from Galway Train Station and our conducted tour of Connemara leaves Galway to the village of Moycullen. From Moycullen the road rises and falls towards the lovely village of Oughterard on the shores of Lough Corrib, traditionally regarded as Ireland's premier angling center. Now the gateway to Connemara opens, and the breathtaking colors of this unspoilt countryside are revealed in all their natural splendor. At Maam Cross, the Connemara "crossroads", there is a replica of the cottage used in the 1950's John Wayne and Maureen O'Hara film "The Quiet Man", which was filmed here. From Maam Cross our tour heads out to Leenane, Kylemore Abbey and Letterfrack, in the shadow of purple mountains rolling down to blue and green rocky valleys, reflecting the rich and varied colors of Connemara. There is a lunch break at Kylemore Abbey and Gardens, an 18th century castle now owned by the Benedictine nuns who run an excellent pottery, gift shop and restaurant here. Letterfrack is one of Ireland's major national parks. The colorful town of Clifden has been one of Irelands leading holiday resorts for generations. It is an excellent touring center beloved by the walker, the biker, the hiker or the fisherman. It was here too, at Derrygimlagh Bog, near Clifden that aviation history was made when Alcock and Brown crash landed after their historic transatlantic flight in 1919. 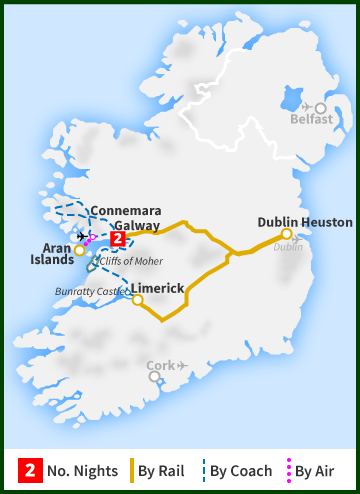 Our tour of Connemara heads homeward towards Galway City now, along the shores of Galway bay, through the Gaeltacht villages of Inverin and Spiddal and looking out across the blue waters of the Atlantic at the unique lime-stone of the Burren and the hills of Clare. After your day's touring you will be returned to Galway Station. Upon arriving at Galway Station please present your Railtours Ireland ticket and travel pack at the ticket barrier and you will be directed to your reserved seats on the train, where you host will be waiting for you. Depart Galway at 6:00 pm and arrive Dublin Heuston Station at 9:45 pm .